The leaked question paper of the Punjab Pre-medical Entrance Test was an exact copy of the original. However, an alternate set of question papers, printed separately as a back-up arrangement and stored in bank lockers at Chandigarh, was then used to conduct the test in which 10,197 candidates appeared across 41 centres here today. Leaked paper has all 200 questions that were in the original paper. Alternative question paper, stored in bank lockers, taken out to conduct the exam. PU was responsible for conducting the test and printing the original paper. A sum of Rs 15-18 lakh was “charged” for providing the question paper. There is a gang behind it, says P. L. Garg, Registrar, BFUHS. 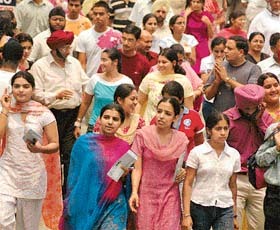 Candidates of PMET-2006 come out of one of the examination centres at Government College for Girls in Sector 11, Chandigarh, on Sunday. Should there be a new law to deal with NRI marriages? In a major breakthrough, the Chandigarh Police busted a five-member inter-state gang allegedly involved in leaking the question paper of the Punjab Pre Medical Entrance Test and helping candidates clear the exam. The quadricentennial celebrations of the foundation of Akal Takht would go down in the history of the Sikh panth as the “blackest day” as turbans of SGPC chief, Mr Avtar Singh Makkar, president, Shiromani Akali Dal (Amritsar), Mr Simranjit Singh Mann, and some other Sikh leaders fell off in the presence of Guru Granth Sahib and Sikh high priests, at Manji Sahib inside Golden Temple Complex here today. 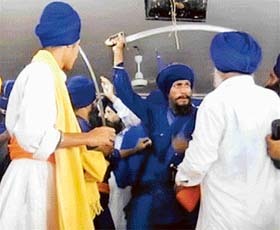 SAD (A) activists clash with SGPC members at Manji Sahib Diwan Hall in the Golden Temple Complex in Amritsar on Sunday. Chief Minister Ghulam Nabi Azad has finalised the list of heads of the five working groups announced by Prime Minister Manmohan Singh at the end of the second round-table conference here on May 25 last. The Congress high command appears to be inclined to accept the resignation of Haryana PCC President Bhajan Lal, who put in his papers yesterday making a scathing attack on the leadership over the “pathetic condition” of the state of affairs in the state. Osama bin Laden has endorsed the successor of slain militant Abu Musab al-Zarqawi in an Internet posting and warned Shiites in Iraq against collaborating with the USA in its fight against Sunni insurgents. “India will be better off signing the Nuclear Non-Proliferation Treaty, which permits the exit of any signatory nation, rather than the nuclear deal with the US that will bind the country for perpetuity”, top nuclear scientist Homi Sethna has said.